Previously known as the C4 Picasso, Citroen’s C4 SpaceTourer is unashamedly family-focused, without looking dull. Behind its wraparound front lights is a people carrier that offers passengers plenty of space, comfort and practicality, as well as excellent value-for-money. It’s not a great deal longer or wider than a Ford Focus but there’s space for three adults in the back and - on all but the cheapest models - they can be slid back for more legroom, or forwards to increase space in the large 537-litre boot. There’s more space for storage in large door pockets, as well as optional drawers under the front seats. Most C4 SpaceTourers also come with underfloor storage in the back - these need reinforcing with an optional filler if you use a child seat with a supportive leg. Three sets of Isofix points in the back provide secure attachment for three child seats if they are narrow enough to fit next to each other. Rear passengers also get their own air vents, a 12v power socket and reading lights. For even more space, the Grand C4 SpaceTourer provides seven seats and a very similar design. In front, a dual-screen display keeps the dashboard clear and uncluttered, including a large 12in widescreen (apart from entry-level Touch Edition), which can be customised to show information including fuel economy figures or the radio station. The car’s speed is also shown here, so there’s no speedometer behind the steering wheel. There's a sense that it's too high-tech: adjusting ventilation conrols on the touch screen is frustrating, but it generally works well; is more sophisticated than a Vauxhall Zafira Tourer and quality isn’t far off the Renault Scenic. The view is expansive from the enormous windscreen, so visibility is good, even though you don’t sit as high as in a more rugged-looking crossover or sport utility vehicle (SUV). These vehicles, such as the Peugeot 3008, Volkswagen Tiguan, Nissan Qashqai and Ford Kuga are increasingly popular because they offer much of the space of a people carrier, without the boxy design. They are also more car-like to drive. Citroen has engineered the C4 SpaceTourer for comfort. At motorway speeds it’s quiet and glides over potholes or rough surfaces. In town, light steering makes it easy to manoeuvre. Rivals, including the Renault Scenic and Kia Carens can’t match the Citroen’s smoothness. The price of this is a car that feels heavy and unsteady in fast corners, where it can lean noticeably: your passengers will appreciate a gentle approach. A Scenic or Ford C-Max are nimbler, changing direction with greater stability. Most petrol and diesel engines provide good performance and fuel economy, making it cheap to run even when the car is fully loaded. It should be cheap to buy as well. As a new car, it’s no more expensive than crossovers or people carriers from Renault and Ford. 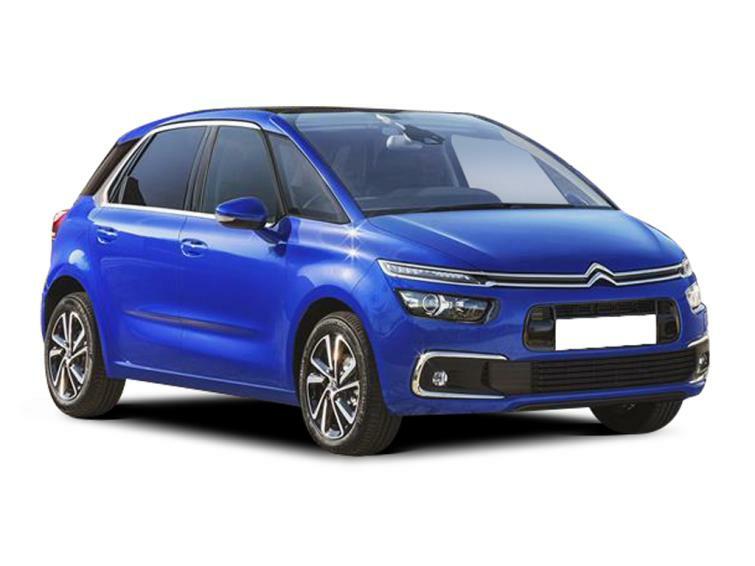 It’s one of the cheapest people carriers to buy used: as long as you search under the previous Citroen C4 Picasso name - there are few C4 SpaceTourers available yet. The name was changed to SpaceTourer in May 2018, but the car is virtually identical, save for some extra safety equipment, including automatic emergency braking, added to top-of-the-range Flair cars. Unfortunately, this useful system is unavailable or optional on cheaper models. The car carries over the five star safety rating awarded by Euro NCAP to the C4 Picasso in 2013. It's only just the most economical engine, but the least powerful diesel returns around 54mpg in real-world driving (much less than the official figure of 74.3mpg). For the sake of 1mpg, you're better off with the more powerful BlueHDi 120 model. The petrol version is best if you do a mix of short and long journeys. Feel trim adds useful sat-nav and sliding rear seats for flexibility - plus massaging front seats for tough trips. There's more optional safety equipment too. Surprisingly efficient, this petrol-powered version is the fastest Citroen C4 SpaceTourer, but don't expect fireworks: acceleration is still fairly average. It may be the most efficient car, but this is a dismal combination that doesn't suit the car's cosseting and relaxed nature. The underpowered car needs plenty of noisy revving (and patience) to get moving, while the black and white display in entry-level trim looks cheap. May 2018 The Citroen C4 Picasso is renamed C4 SpaceTourer. Flair trim gains automatic emergency braking. The car's trim level dictates the equipment that comes as standard. Cheapest is Touch Edition, followed by Feel, then Flair. BlueHDi cars are diesel-powered, whereas PureTech and THP versions are petrol. The number relates to the car's power - the larger the number, the more power it has. All C4 SpaceTourers have a Start & Stop (S&S) function, so they can automatically switch off the engine to save fuel, when stoped at traffic lights for example. Automatic gearboxes are badged EAT, which stands for Efficient Automatic Transmission. EAT6 cars have six gears; EAT8 models have eight for quieter driving and better fuel economy. Citroen's engine line-up isn't quite as confusing as it looks. Firstly, there’s a choice between petrol and diesel engines. Diesel cars are more commonplace, so you’ll have more choice and fuel economy is better than in the equivalent petrol cars, but only by around 8mpg in real-world driving. Petrol cars are quieter and slightly cheaper when new. All engines are badged S&S, for Start & Stop, which means that they can turn themselves off automatically when stopped (at traffic lights, for example) to save fuel. The higher the engine’s number, the more powerful it is. If you do opt for diesel, then the slow BlueHDi 100 engine is best avoided unless you’re determined to pay the lowest possible price. The BlueHDi 120 motor is more powerful, so it doesn’t need hard revving when you accelerate. Ignore the lofty official fuel economy figure below; you can expect around 54mpg in real-world driving, according to the Equa Index, which publishes fuel economy figures based on public road testing. The figure is virtually the same as the least-powerful diesel. The optional automatic gearbox cuts fuel economy by around 2mpg. The cheapest petrol option - Citroen’s Puretech 110 - struggles to get a fully-loaded C4 SpaceTourer moving, so the PureTech 130 is a better option. Both return around 46mpg in real-world driving. Surprisingly, the most powerful THP 165 petrol engine is almost as efficient too: you can expect to see around 44mpg if you avoid putting your foot down frequently to make the most of its relatively speedy acceleration. It’s not yet available with the eight-speed gearbox. Although all C4 SpaceTourer models include a reasonable level of standard equipment, you do need to make sure that you choose the right one, because many features aren’t available as options on cheaper versions. Aircraft-style fold-down tables, for example, only come with top-of-the range cars. The cheapest Touch edition models include rear parking sensors, climate control, automatic headlights and windscreen wipers, 16in alloy wheels and plenty of safety equipment, including three sets of Isofix mounts for child seats and hill start assist, which prevents the car rolling backwards when pulling away. All C4 SpaceTourers have a 7in screen in the middle of the dashboard, controlling radio, ventilation and phone functions. It also includes Apple CarPlay and Android Auto, for easy control of certain phone apps. Above this is a second screen. In entry-level cars, this is simply a black and white display showing your speed and driving information, such as fuel consumption. Moving up to Feel cars brings a colour 12in widescreen, which can display directions from the sat-nav, which is also included, as well as a wider range of information. The screen makes these cars seem more advanced, as do additional features, such as front seats that massage passengers and the sliding rear seats. Larger 17in alloy wheels come as standard, while a panoramic sunroof and extra safety equipment, including automatic emergency braking, is available as an option. Flair cars are better equipped than older C4 Picasso Flair models, as they include automatic emergency braking and blind spot alert as standard. The panoramic sunroof comes as standard, as does a reversing camera, keyless entry and start, part-leather seats, plus self-parking. There’s a motorised bootlid that you can open by poking your foot underneath the rear bumper. Rear tray tables and rear window sunblinds are included too. Optional equipment packs to look out for include the driver assistance packages, which enable the car to react to situations: it includes adaptive cruise control that can maintain a safe distance from the car in front by adjusting speed, as well as active lane departure warning that will steer the Citroen back on track if it drifts out of its lane. Citroen’s three-year warranty applies to the C4 SpaceTourer, but comes with a 60,000 mile limit, which is similar to most rivals. As it’s effectively the same car as the C4 Picasso, the SpaceTourer should is expected to have a similar reliability record to the earlier car … which isn’t saying very much. In the 2018 Auto Express Driver power customer satisfaction survey, Citroen was ranked the 24th most reliable car brand - out of 26. The only positive angle is that Renault was worse, in 25th position. Even so, only a minority of owners (15%) reported a problem. The most common issues on Citroen vehicles tend to relate to electrics, which can be irritating but don't always leave you stranded at the side of the road. For both price and availability, you're best off looking for used Citroen C4 Picasso cars. You’ll find a similar engine line-up and the same trim levels, with virtually identical levels of equipment. Most cars sold after September 2016 are updated versions, and have newer software, including Apple CarPlay and Android Auto, as well as a more responsive screen that requires less prodding than earlier versions. Although the Citroen holds its value well for a people carrier, it’s worth considerably less as a used car, bringing the cost of some 2017 cars down close to £13,000, or around £200 a month with representative finance. You’ll struggle to find a comparable crossover or SUV for so little. Citroen C4 SpaceTourer is the new name for the Citroen C4 Picasso. A panoramic sunroof comes as standard with the top-of-the-range Citroen C4 SpaceTourer Flair. All of the dashboard information in the Citroen C4 SpaceTourer, including the speedometer, is shown in two central digital displays. These are both colour screens, unless you choose the entry-level Touch Edition car, which has a black and white top display. Apple CarPlay and Android Auto are standard across the Citroen C4 SpaceTourer range. Opt for the more expensive Citroen C4 SpaceTourer Flair model for rear tray tables.